Personal Thoughts: I’ve wanted to do Rain for years. 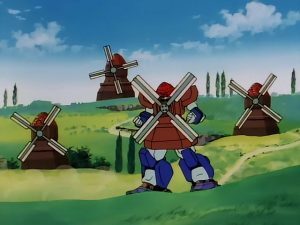 G Gundam was the only gundam series I ever liked and thats because it was just so dumb. This is Nether Gundam. It’s from the Neo Holland. It’s real. I don’t know why either. I’d actually attempted to do Rain once years ago but I hated everything about it. I picked the wrong fabric for the jacket so it was too blue and didn’t hold it’s shape right. The red was TOO red and also a size too small (what happened there?!) so I couldn’t actually wear it. I was disappointed in the outcome and realized at this point I had all the skills that I could re-do it properly. I choose softer fabric colors this time. I hated my original Rain because I used too harsh blues and reds. I relied on what other cosplayers did and really liked that some used a soft pink and blue instead of the harder colors. I did the same as well since I also really had the red and blue combination in general. Using two patterns, I made mock ups of both the dress and jacket then cut them down to the appropriate size. I kept taking in the mocks until I was comfortable with how it sat both on the mannequin and myself before I undid all the work and used the mocks as patterns for the fabric. I forgot to account that scuba fabric is really stretchy and the type I had was thick so once I had completed the dress, it was a bit too big on me. I had to take it in a bit and even now, I have to take it in by an inch because it’s still a bit too big. I attached a working zipper to the front and finished it off. With the jacket, I lined it with a light blue fabric, made a fake pocket for the front then worked on the jackets cuffs. This was one of the reasons the old jacket failed. The cuffs were awful and held no shape. This time, I used two pieces of interfacing for both cuffs and used an invisible stitch to attach the lower part of the jacket to the upper part of the cuff. Because of the invisible stitch, the cuff looks like it floats on its own and holds it’s shape perfectly! I was again strapped for time. During the construction of Rain, I had moved apartments, gotten a new job and suddenly it was time for PCC. The only other thing left to do was make the collar and the pouch. I made the pouch using faux white leather and again alternated it so that the only thing it could honestly hold was my phone and business cards. I used a magnet to keep the pouch snapped closed at all times. Finally, I sloppily did the neck piece by creating it out of worbla. I have plans to re-do the piece since it’s pretty awful but overall, I’m incredibly happy with my remake of Rain!